My criteria may be different from yours, so it's important for you to keep a list of the features, abilities and characteristics you value. There is no one device that suits all purposes. I own three digital recorders plus an audio interface for a laptop. And I use all four of these hardware setups depending on my needs. Of critical importance is what sort of microphones the recorder can use. For our purposes there are three types. First, many of the smaller recorders come with a pair of built-in stereo electret condensers so you can get recording without any additional gear. These are certainly convenient and might provide sufficient audio quality. But you can improve matters by using an external microphone (in which case the microphone preamp becomes the limiting feature). Second, almost all recorders can supply plug-in power (PIP) on a stereo mini-jack, which allows the use of certain low to medium quality condensers. The PIP supplies a small voltage (5V) that the microphone capsule needs in order to work. Still other recorders can provide phantom power on XLR jacks, thus allowing you to use any and all professional mics. Phantom power is an audio standard for providing 48V to the microphone2. This setup assumes you don't mind carrying two microphones, two cables, a microphone stand, plus mounts and fittings. This is a whole different world of "convenience" from simply pointing your recorder at the sound source. But it is necessary if you wish the ultimate in stereo sound quality3. Which brings us to what is often the most important criterion: price. Some of us may have $4000 to spend, but for others $400 is already sufficient. The remarkable fact is that great units are available on the market while staying under that lower figure. Now I'll present the table of 20 recorders, in order of increasing size. 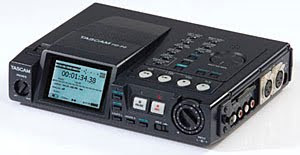 Very expensive or obscure recorders have been omitted, though the Sound Devices 702 has been retained as a baseline for comparison. Older models have been ignored in favour of their replacements unless both are readily available and offer some distinct advantage. Brand and name of the recorder. Dimensions in millimeters, largest side first. Price in US dollars, since this currency is the easiest to compare for all of the units. These prices are for new units and reflect generally-available current pricing, which is sometimes a good deal less than list. Refurbished and second-hand items may be found to reduce the cost. Packages for different international markets sometimes include different accessories, so be sure you know what you are getting. Presence of XLR mic inputs with phantom power. Equivalent Input Noise (EIN) A-weighted at 150 ohms, in dBu. These values have been taken from the excellent Avisoft Bioacoustics, with further details from The Wildlife Sound Recording Society. A "+" means the unit has that feature; a "-" means it does not. Samson   Zoom H4n      156 x  70 x 35   382   280  $ 300    +    +    ? As you can see, I have divided the recorders into three categories for ease of comparison: Pocket, Hand and Shoulder. The Pocket category includes small recorders, less than 200 cubic mm. These can easily be used in the hand and stored in a jacket pocket or purse. They are not much bigger than a mobile phone. None of these are big enough to have XLR sockets for professional external mics. Some include built-in microphones. Prices range from $200-500. The second class are Hand recorders; these may be too big for any but the largest pockets, but are nonetheless quite compact, from 200-500 mm. Nonetheless they are still very light and easy to carry. All have built-in microphones as befits their purpose as all-in-one location recording solutions. The larger units even have XLR jacks. This is the cheapest category with prices from $170-450. The final class are recorders generally meant to be used slung over the Shoulder, as they are too large to be operated in the hand comfortably. These are 500 mm in volume and up... way up in some cases! All of these have XLR jacks but none have built-in microphones, as all-in-one operation is not expected in this class. This is by far the most expensive category, since it includes recorders with many pro features. Prices range from $550-1900. All of the items on this list record to flash memory except the first; it's a MiniDisc recorder. I include it here since, remarkably, it's still the smallest and lightest digital recorder available. UPDATE: No longer true. MD at first used only the Sony-proprietary ATRAC file compression scheme. Uploading to the computer required use of Sony software and a brain-bending series of operations that limited operations based on copyright concerns. Plus it wouldn't play MP3 files, which is what everyone was using by then. Three strikes and Sony were out; everyone stopped caring about MiniDisc. Late in the product life cycle (far too late) the Hi-MD line was introduced. These models used significantly larger 1GB cartridges and could record at uncompressed 44.1KHz 16-bit (generally good enough for any signal they would be fed). They supported MP3 files. The software was updated to automatically convert files to standard WAV format. Copyright restrictions were removed. The process is still nowhere near as easy as dragging a file from one folder to another. But it works. All the complaints leveled against MiniDiscs were answered. Incredibly, the Sony MiniDisc has almost unmatched sound quality. By restricting the sample rate and bit depth, the Sony engineers could use a very high quality conversion chip. Compare the EIN values in the table. Then note that the Hi-MD actually has more gain than the Sound Devices (75dB versus 70dB). Wow! The major limitation of these units is the minuscule interface and poor recording ergonomics. I conducted a full review of the Sony MZ-RH10 four years ago. It was the second-last model. The MZ-RH1 in the table above was the final MiniDisc product from Sony, who moved on to flash recorders like everyone else. It had the further advantages of compatibility with the Mac and improved ergonomics. You will notice that I have not indicated which recording formats the devices use. That's because it generally does not matter. Even the cheaper units can usually record at 96 KHz and 24 bits. That is far better quality than what the pre-amps can supply. Nonetheless, I generally record at 24 bits so I can lower the input level to avoid clipping and still have lots of bits for encoding actual signal. But I don't bother with 96 KHz unless I feed signal from some very good external microphones (which I do, when required). Most recorders will also record directly to MP3 in order to gain enhanced recording time when space is limited. Now that flash memory is so cheap, this is not so much of an issue. But if you're taping spoken word, radio broadcasts or something else low-fi, it's handy. A more extensive recorder list was put together by the NatureRecordist List. My own list was in progress much earlier, so I have not directly compared my numbers to theirs. If you find mistakes, let me know. 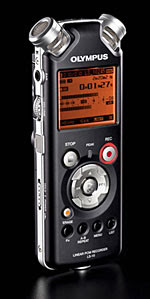 Please continue reading in the second of three articles, Which Portable Digital Audio Recorder? Please donate using the links in the sidebar if you appreciate the work that went into this. Thanks! I do keep extending the table, as I have time. 1 EIN is actually measured in negative numbers below reference, but I have used the absolute value for the purposes of this article. 2 Unfortunately some recorders cheat by not providing the full 48V required by the phantom power spec. Hence they may not support all microphones. The MicroTrack II is an infamous case in point. I have also seen small PIP voltages being described as "phantom power", but that is totally incorrect. 3 You can also use a single microphone with stereo capsules. Or you might prefer a single cap shotgun, depending on your application. Discussion of microphones and recording techniques is outside the scope of this article. One correction: I stated that all the recorders were flash-based except the MiniDisc. I forgot that the Korg MR-1 records to a hard drive. I've made a few typographic corrections and slightly expanded the definitions of technical terms. And now I've removed some material that suits the second article better. And added links to the footnotes. I had some information confused between the M-Audio MicroTrack II and the older 2496 model. This has been corrected. Sony PCM-M10 added to the list. Prices adjusted (down) on Edirol R-09HR, Tascam DR-1, Samson Zoom H4n and Tascam HD-P2. Prices will continue to fall, especially as new models come out. I will not guarantee to track these, so please hunt for the best deal! I don't understand this sentence: "Then note that the Hi-MD actually has more gain than the Sound Devices (75dB versus 70dB). " But from the table SD702's EIN is 130 and sony RH1's EIN is 124. Larme: Gain is how much amplitude boost can be applied to the input signal. It is a different thing from the self-noise. Having more gain on hand means a quieter source can be recorded by the MD (5dB more than the Sound Devices. Though the SD is 6dB quieter. Corrected microphone entry for Marantz recorders. These are not primarily meant to be used with the built-in mics -- I had forgotten they even had them! You might add the Edirol R-44. It is a "shoulder" recorder, accepts XLRs, has phantom power, and also has a pair of mics built in. Added Olympus LS-7 / 3, Olympus LS-100, Roland R-26, and Edirol R-44. Olympus LS-10 and LS-11 replaced with cheaper LS-5. Tascam DR-100 updated to Mk II version, with 6dB EIN improvement. Dear Robin, my name is Rose and I am writing to you from Hungary. First of all thank you very much for the articles about the portable digital audio recorders. I am absolutely new in this field and your summery helped me to understand the very basics. Now I would like to buy a recorder but unfortunatelly I still do not know which one to choose. So I would like to kindly ask you to help me with it. I have already checked the devices that are on your list plus I added the Roland R-05 (good size and BBC bought quite many of it). Than I have made the first cut by the size and the price. After this my preferences are Olympus LS-3, Roland R-05 and SONY PCM-M10. I would like to use the device for varied purposes but the most important is pop/rock concert (sometimes with story telling parts) taping as standing in the audience. I don!t have big demands but I would like to have a „listenable” result. I think that many times it would be nice to hide the recorder and also the mics as much as possible. In the different shops I was highly recommended to use the in-built mics and no external ones at all. And no one could recommend me any external mics for that purpose. But I think that using external mics can help me to reduce the handling noise and also helps to avoid touching the in-built mics by hand or by some part of my clothing. It seems to be much easier with small mics fixed on the collars perhaps and they would also give me two free hands for moderate clapping. But I don’t want to spend the same amount of money on he mics that the recorder costs. I collected my questions into two groups. Situation 1. Outdoor (indoor) pop/rock concert, musical event with story telling parts, I can hold the device in my hand if necessary. - Will I collect disturbing handling noise if I don’t use external mics and I just put the recorder into my upper pocket of my jacket with the mics „standing out” of it? - What’s the difference between onnidirectional and unidirectional mics? Situation 2. Indoor pop/rock concert, musical event with story telling parts, I can not hold the device in my hand and it should be hidden. - What will be the result if I use the in-built mics and I put the recorder in standing position into a small shoulderbag with open top? - Talking about how to hold the recorder. What will be the effect if the recorder is laying in my lap towards the stage? What will be the effect if I put a thin scarf on it and pay attention not to move it later on? What will be the effect if the recorder is in standing position but the width of it, so the axis line of the two inbuilt mics is not paralel with the stage but perpendicular to it? I thought about choosing the Olympus LS-3 device to use the middle mic of it because of this position. Is it a good idea? - How does it influence the recording quality if the recorder is in the open shoulderbag with windscreen on it just to hide it a bit? So how would you choose? A smaller decice can be carried and also hidden if needed more easily. The best is Olympus LS-3 from this point of view. If the middle mic between the side mics helps to avoid the problem of proper positioning of the device than again Olympus LS-3. If we talk about how easy to handle than Olympus again I guess. But using external mics seems to be quite useful and comfortable for me but than the questions are different. The size is not so important any more but I still wouldn’t buy a bigger one than the three mentioned above. But than which recorder with which cheap (around 100 $) extarnal mics (I need exact product names and types) that a beginner can (almost) easily use for not a professional purpose? Sorry for being so long. I hope you can help me. First, I wish to emphasise that there are several good portable recorders on the market. For general purpose recording it won't matter too much which you get. If you have specific needs or budget that will narrow down the models you will wish to consider. It seems that in your case the LS-3 is indeed a good choice. It does not have the ultimate lowest noise but that shouldn't matter in your case. Third: As you point out, you will need to avoid handling noise, which includes noise conducted through your clothing. You could indeed put a recorder in your lap with some thin material over it. This will have the effect of reducing the high frequencies most of all. Some gentle EQ in post production might compensate. But this approach will be far from ideal. For one, you will need to keep rather still. If people are sitting in front of you, their bodies will block the sound significantly. I anticipate that this will mute even more of the high-end. It is indeed MUCH better to use a pair of external electret microphones powered by PIP. These can be worn on a hat, on your glasses, on headphones, your collars, whatever. Handling noise from the recorder will no longer be a factor. You might still need to be rather still, since moving the perspective of the mics will change the stereo image. I am not sure who would recommend the internal mics over external. The only real benefit is that they are already there and hence save you money. There are many potential downsides, as the articles I referenced previously cover in detail. Depending on how much you have to spend you can get electrets MUCH better than the cheap ones included in the recorders. I hope this helps to get started. If you have further microphone questions, please post them on an appropriate mic article, so they will benefit other interested readers. Thank you very much for your answer, it helped. I have checked your articles on choosing microphones but I will read them again.